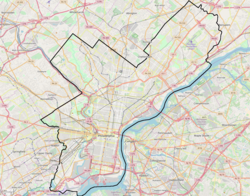 The neighborhood of Ludlow is a small neighborhood in Philadelphia, Pennsylvania. It is bordered by Girard Avenue to the south and Jefferson Street to the north. It extends from 6th Street west to 16th Street. Ludlow is about 65.9% African American, 18.9% Hispanic, 10% White, 4.8% Asian, and 1.4% all other. Ludlow is the site of the Yorktown Historic District. This page was last edited on 28 October 2017, at 16:19 (UTC).